From top left: green hat 1 ball. Blue hat with cable or cream helmet: 0-2yrs, 1 ball, 3-7yrs 2 balls. Pink beret: 0-12mths 1 ball, 1-7yrs 2 balls. Based on 50g balls mixed fibre yarn. Tension: 22st/ 28 rows to 10cm, 4mm needles. 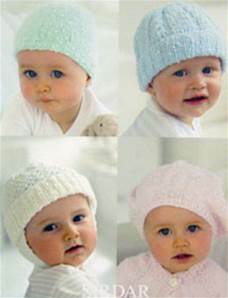 Shown in Sirdar Tiny Tots Dk, also suitable for Snuggly DK, Baby Bamboo or other baby DK - amount may vary. 3.25mm and 4mm needles; cable needle for blue hat, st holders and 1 button for helmet.